These deliciously divine Salted Ginger Almond Butter Cookies are gluten-free, dairy-free, free of refined sugars, and flour-free! 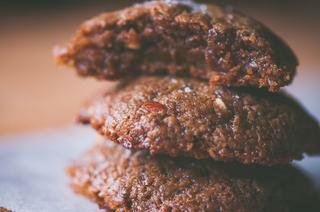 These super chewy and flavorful cookies require only 5 simple ingredients to make. I've recently fallen in love with this Rose Salt . . . This Rose Salt from Suncore Foods looks amazing, smells amazing, and tastes like heaven. I've yet to find another to compare; and it was my definite inspiration for these cookies! These cookies are heavenly. So simple and easy to make, yet so complex in flavor and texture. They are a new favorite around here! Healthy guilt-free treats with a wonderful aroma and taste! I'm a big fan of these if you can't tell, and baking something without the use of flour still inspires a bit of magic in the kitchen for me as well! I hope these deliciously chewy cookies do the same for you! In a large mixing bowl combine all of the above ingredients.Mix swiftly until well combined and slightly glossy.Form into a ball, cover, and refrigerate for at least 30 minutes, or until ready to bake.Preheat oven to 350°F. Line a cookie sheet with parchment paper.Form your cookie dough into rounded tablespoon portions. Roll into balls and place on your parchment paper lined cookie sheet.Bake for 11-13 minutes, or until bottoms and edges are golden.Let cool before serving.Enjoy!